As you can see from the photos, Spring is in the air. The outside temperature is 11 degrees, sunny with a bit of wind. I even saw foraged white and yellow pollen going into one hive! The photos show a honeybee foraging on the Mahonia in the garden and bees doing housekeeping by throwing out the dead. All the hives had activity at the entrance and judging by the amount of wax debris under the hives there is a lot of activity going on inside as well. I have 15 hives at my home apiary, 14 Nationals and 1 WBC in my garden as a “feature”. 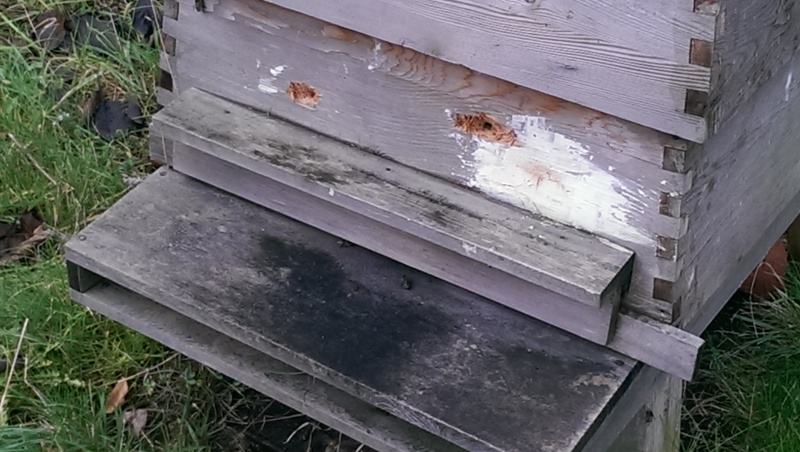 Last winter the WBC was the only hive to be attacked by a Woodpecker. Looks like the same bird came back this year, the white patch is the last year’s repair, the first new hole I filled with a stick so it made another! The questions are why WBC and why just one hive out of 15? None of the hives have woodpecker protection and the Nationals must be a more fruitful target. Fixed an error with colour change in Horse Chestnut Flowers, it is yellow to red not red to yellow as previously stated. Thanks to Emily Scott for pointing this out. You are currently browsing the Mid Bucks Beekeepers Association Blog blog archives for January, 2015.